On New Year’s Eve, I looked into the sky, and white flakes fell. Never had such a thing happened in all of my NYE’s. The dogs’ water bowls turned to blocks of ice. Never had I been forced to boil water in a kettle LIKE IT’S 1891 simply to make my dog’s water be water again. Is this global warming? Texas has forgotten how to Texas. But Russia never forgets how to Russia. Russians spend every winter staring into the frost’s white face. Alone I stare into the frost’s white face. Such is the first line of poetry from Osip Emilyevich Mandelstam, whom we will be profiling this winter’s morn. Oh, sip some coffee as we study his life. Who knew the name Emily was just an abbreviation for Emilyevich? Oy! Back in 1891, when people routinely boiled water in kettles instead of microwaving mugs, little Osip was born in Warsaw. Fortunately, his parents were well-off, and he was sent to the swanky Tenishev School, where he tried his hand at poetry. His first poems were printed in 1907 in the school’s almanac. Because he was privileged, he was able to enter the Sorbonne, which he left the next year. Because he was Jewish, he could not attend the University of Saint Petersburg. So he decided to not be Jewish and converted to Methodism instead. What? But Salomea did not bat a keen eyelid at Osip, and his ardor was unrequited! Perhaps he should have sung her name to the tune of “Dulcinea.” Salom-EA! Instead, he married a girl from Ukraine named Nadezhda Khazina. Listen how it rolls off the tongue. 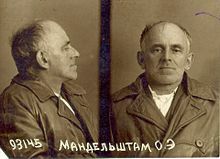 In 1922, they moved to Moscow, where he published a book of poems called Tristia. To pay the bills, he worked as a newspaper correspondent. But Russia was no land of the free, and Osip was inspired to write the poem “Stalin Epigram,” describing the climate of fear (not just frost) in the Soviet Union. He called Stalin the Kremlin Highlander. His thick fingers are bulky and fat like live-baits, and his accurate words are as heavy as weights. Cucaracha’s moustaches are screaming, and his boot-tops are shining and gleaming. power’s unbearable yoke of fears. This entry was posted in Funny Author Names, Funny Names in Literature, humor and tagged Mandelstam. Bookmark the permalink. Wow such an eventful life. Shame it was so short. The power of poetry. Wow. Interesting life. He crammed a lot into his brief life, that’s for sure.